We believe that GOD is omnipresent but I feel and believe that NOISE is omnipresent. Whatever you do and wherever you are, the noise will find you. However, there isn't any doubt that sound in some or another form is very important for our survival. Noise Blocking Window Film: What is it and How does it work? In fact, we don't have a problem with any form of sound, be it whistling, horns, fireworks cracking etc until the pitch and amplitude of noise is under the control. However, if the decibels increases and crosses the set level of thresholds, most of us feel the noise is irritating and intolerable. The worst part is the high decibels can cause an adverse effect on your health. Unfortunately, we talk a lot about air pollution, water pollution but we rarely get involved in a discussion over the topic "sound pollution". Aren't we taking the noise pollution seriously? Still, I am waiting for the convincing answer, I hope as well as expect that my readers will definitely throw some light on my concerns. Let's discuss the noise pollution in the best possible manner. If you are the regular reader of this blog then, you will definitely be aware of the fact that we discuss loads and loads of things related to soundproofing. Be it, soundproofing a door, a room, a window or anything else of that sort. After all, you can't get your home perfectly soundproof by simply spending tons of dollars. You also need to be aware of the problem and the various possible solution to it. What is the problem that I want to resolve through soundproofing? For example, you don't have to soundproof the entire apartment to get rid of the drum noise. Simply soundproofing the drum room can work for you. Soundproofing is a technical domain and it is important for you to have at least some basic knowledge regarding this domain. In today's world, you can soundproof the components of an apartment separately to serve your purpose. Though it's always good to have your entire apartment soundproof still depending upon your requirement and budget, you can soundproof doors, windows, room or even household appliances such as washing machine etc. In today's post, we will talk about the noise blocking window film and also, will discuss whether its worth spending dollars on it. Unfortunately, most of the time, most of our buying decisions are budget driven and, this happens with most of us as we have a limited source of income. Moreover, I have found some idiosyncratic scientific discoveries on this subject and definitely, you will enjoy the data-driven information. 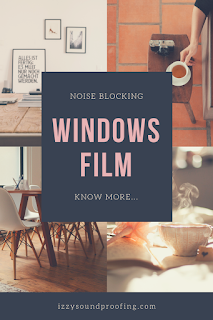 What is noise blocking window film? Windows can be categorized into types depending upon types of materials and types of windows. These factors significantly influence the sound properties of the windows. Like our fingers which aren't of the same shape and size, these windows will also NOT be having similar soundproofing properties. Some of them will be more, some less soundproof. In the layman language, a noise blocking window film is an interlayer film sandwiched between two external layers. The middle layer is termed as a core layer and it comprises of the soundproofing properties. The core layer is of utter importance as it is the one responsible to reduce the sound transmission. 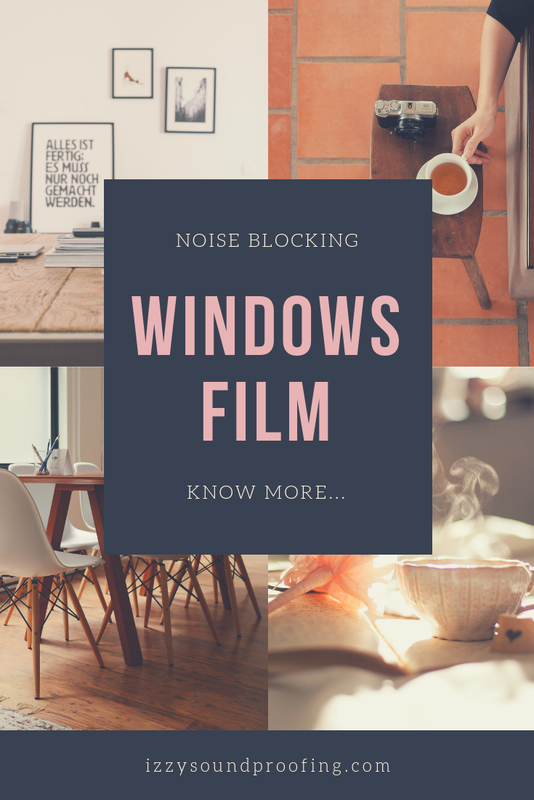 How does noise blocking window film work? The process is simpler than you can ever imagine. Trust me, I am not kidding or joking at all. The sound needs a medium to travel. For example, air is a medium, water is also a medium. When sound waves get an obstacle on its way to reaching the destination. A lot happens at the obstacles or hurdles. Depending upon the density of the obstacle, a sound wave may fully traverse it or bounce back. But the reality doesn't lie in black or white rather it lies in the shades. So, if there is an obstacle in the path of sound waves then, few will bounce back and, rest will traverse the obstacle. The noise blocking window film observes the sound waves and thus, making it less loud. There are also films with different insulation properties. So, you can also find films which have the capabilities to reduce the heat and light. Do you know the most distinctive hear range of humans? It ranges between 1000 to 4000Hz. In case, you are applying the noise blocking film on the windows then, you can expect a drop of 5 decibels. Trust me, this drop will be considered significant by your ear. I hope you are now clear with the concept that these films use. By applying these films on the windows of your apartment, you can make your home a quieter place to live in. Can be used with different kind of glasses. 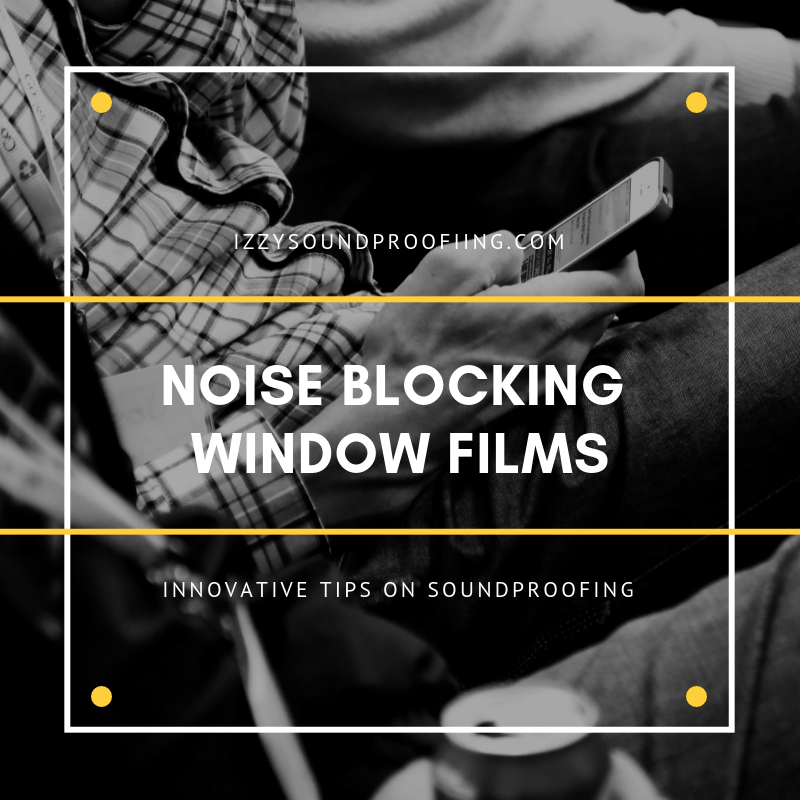 The feature mentioned in the bullet points are general and as a buyer, you can get a rough idea about the things that you can expect from these films but at the same time, if you are gonna take final call on the noise blocking window film then, it's advisable to consider the below mention points. We aren't satisfied with any discovery or invention. We want more and more, that is a typical human mentality. People were trying to push the limit and make an upgraded version of it similar to the one that we have when we buy software. Some scientists from Singapore were successful in filling the gap between the manufacturer prediction and end customer expectation. They did something exceptionally great. They achieved the goal of making a noise blocking window film which has the capabilities of NOT only blocking undesired noise but also, plays the music. So, in short, they succeeded in coming up with a solution that can literally help your brain to relax completely. We all know that music acts as a catalyst when it comes to relaxing. Correct me, if I am wrong? The window film is made up of polymer and strengthened with transparent lamination. The concept used by the film is similar to the noise-canceling headphones. If there is a change in the electric voltage, the film will respond. There are two layers of window films and their task is to channel the outside noise. Before the outside noise enters the room, it has to go through a short passageway between the layers and the speakers lining the window destroy the noise. So, the best part of this idiosyncratic method is that you can keep your window open. An innovation is only considered a breakthrough if it comes with a solution for an existing problem at a cost which is financially accepted so that more and more person can try the solution. At times, there have been some mindboggling research and solutions were really out of the box. But, due to the high cost, the solutions weren't globally acceptable. Though the research was technically successful still it was considered economically failure. However, the noise blocking window film is a true success in both the sense. If you are an avid reader and also, a regular reader of this blog then, I am sure you must be aware of the STC rating and why is it considered so important? STC is abbreviated as Sound Transmission Class and is a scale to check for the sound blocking capabilities for a material. The material with high STC ratings is better at blocking sounds. The STC rating is very useful when you are planning to buy materials for soundproofing your apartment, room, door, car, bathroom etc. The high STC rating really makes sense when you have to compare between two soundproofing materials that pretty well sounds the same. I consider STC as a key deciding factor when it comes to buying a soundproof material. If you type on Google " how to soundproof a window", you will find loads and loads of articles and each one of them is trying to suggest or sell you a certain product or product line. This is definitely an information overload and unfortunately, most of the consumers either end up buying nothing or something that doesn't suffice to their requirements. Well, the solution lies with you and needless to say, there can't be a generic solution. For example, I have to buy a noise blocking window film then, my requirement can be a high-end film, a budget film, a low budget film etc. It's just a simple example, there can be numerous decision parameters for a buyer. So, you have to first set your requirement and the parameters that you are looking for in a window film and then, start searching for related products, articles, products reviews and so on. A random search will only confuse you and will end up buying you a wrong product and unfortunately, the product reviews websites are blamed for the same. In fact, to some extent, it's correct to blame them as they have set the parameters for which they think the products are the best. For example, whenever we review a product, we clearly mention the parameters on which we think the product stand tall and also, the reason why you should buy it? Before we move further, allow me to share some mindboggling and beast product review posts. Suppose I have to buy a noise blocking window film then, what will be my approach? I will be asking a few questions to myself so that I am clear with my requirements. What's the frequency of sound that I want to eliminate? Do I need to soundproof multiple windows or a specific window? What is the amount of money I am looking to spend on this project? Is it on my priority list? Should I get it done by professionals or DIY? Finding the answer to these questions will bring me a step closer to finding the correct and cost-effective solution. If you are the one who is NOT ready to compromise on the elegance of your home decor then, you must consider "aesthetic products". The best solution for you is the one that works for you. This noise blocking window film may cost you a bit more but it's worth every single dollar spent. We are surrounded by different kind of noises and getting a small deduction in these noises can tremendously improve our peace of mind. I hope you will definitely ask yourself a few questions before buying a soundproofing material next time. Have you ever used noise blocking window film? We would to hear and share your feedback with our readers.